The air is filled with the aroma of decadent cakes being pulled out of the oven, juicy chicken being roasted to perfection, potatoes being sautéed and salads tossed. The holidays are the perfect time to satiate those taste buds, and if it’s a cosy Christmas meal for friends, pull out all the stops and whip up a feast. Of course, it would be perfect if you could conjure the said feast. After all, who wants to slave over a hot stove all day long? Combine the butter and sugar till the mixture is pale. It’s best to use an electric whisk or a stand mixer for this — or you can give your arms a good workout. Add the eggs and mix further. Sift in the flour and baking powder. Add the vanilla, rum-soaked raisins and milk. Mix them through. Pour into small tea cups or ramekins. Fill only halfway through. Refrigerate for 30 minutes. In the meantime, preheat your oven to 190 degree Celsius. Bake the cakes for six minutes, or until you see a crust forming. They should be runny in the centre. Remove them and serve with cold heavy cream. Butterfly the chicken breast and flatten using a kitchen mallet/ rolling pin/ tenderiser/ heavy pan. Marinate the inside with salt, pepper and olive oil. Marinate the outside with salt, pepper, peri peri powder and olive oil. Let this sit in the fridge for 30 minutes. In the meantime, prepare the filling. Heat olive oil in a pan. Add the onion and garlic, and sauté till soft. Add the mushrooms with some salt and pepper, and cook till they are soft. Add the spinach with some salt and pepper. Cook just till it wilts. Remove the mixture and place two heaped spoonfuls on the inner side of the chicken breasts. Roll the chicken and hold it together with toothpicks or kitchen twine. Pre-heat an oven to 180 degree Celsius. Take a frying pan and heat about three tablespoons of olive oil, till it is smoking hot. Fry the chicken till it’s brown on all sides. Now, place it on a tray and place it in the oven for 10 minutes. Take it out and rest it for five minutes. Serve it with a salad and mashed potatoes. If you want some sauce on the dish, then just reduce some tomato juice with salt and pepper and a touch of Tabasco sauce. Whisk some cold butter into this and you have a lovely tangy sauce to go with your chicken. Preheat oven to 400 degrees F. In a large skillet over medium-high heat, heat oil. Add onions and cook, stirring occasionally, until golden, about 8 minutes. Reduce heat to medium, then add carrots and garlic. Cook until onions are brown and carrots are just tender. Stir in parsley and cook for 1 more minute. There are so many techniques out there; many people I know claim that their recipe is “the best.” My dear pal and colleague, Laurie Burrows Grad, esteemed for her cookbooks and prowess in the kitchen, is adamant that this is “The One” — the best roast chicken ever. It is Seriously Simple and delicious! To butterfly a whole chicken means to remove the chicken’s backbone so you can open it like a book, or a butterfly, and lay it flat so it will cook evenly. If you don’t want to butterfly the chicken, ask your butcher to do it for you. Laurie suggests that you embellish the chicken with rosemary or other fresh herbs. I sometimes cut up an orange or a sweet Meyer lemon and add it to the potatoes on the bottom of the pan. You can also add carrots and mushrooms to the potatoes. – Heat a convection oven to 450 degrees or a standard oven to 500 degrees. – Rub olive oil on both sides of the chicken, season with seasoning salt and pepper, and place in a large roasting pan skin side up, splayed out. – Place the cut potatoes and shallots around the sides and coat them with olive oil cooking spray. Season the potatoes and onions with salt and pepper. – If using a convection oven, roast the chicken at 450 degrees for 45 to 50 minutes. If using a regular oven, roast it at 500 degrees for 45 to 50 minutes. To make sure it is cooked through, use a meat thermometer and make sure the thigh is at 165 degrees. – Remove and let rest for 10 minutes. Carve and serve alongside the potatoes and onions. 1 Unroll the leg of lamb fat side down onto a work surface. Using a knife, make ¼” slashes all over the inside of the leg. Squeeze the lemon over both sides of the lamb and drizzle with olive oil. 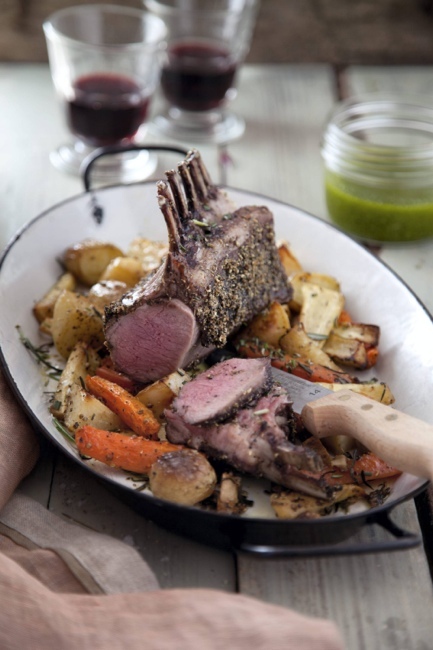 Season generously with salt and pepper and rub lamb with rosemary and garlic. Transfer lamb to a parchment paper–lined rimmed baking sheet and refrigerate for at least 2 hours and up to overnight. 2 Let lamb come to room temperature. Build a medium-hot fire in a charcoal grill or heat a gas grill to medium-high. (Alternatively, arrange a rack 5″ from the broiler element and heat oven to broil.) Spread lamb over grill grate and cook, turning occasionally, until browned and cooked to desired temperature, about 15–18 minutes for medium rare. Transfer to a cutting board and let sit for 5 minutes. Following the seams of fat and muscle, cut lamb into 5 large pieces. To serve, thinly slice each piece against the grain and transfer to a serving platter. Andreas Xerakia, a Greek-born resident of New York City (pictured below with his family), slow-roasts a whole lamb every year for his family’s celebratory Easter dinner. Here’s a smaller, more streamlined version of that dish. 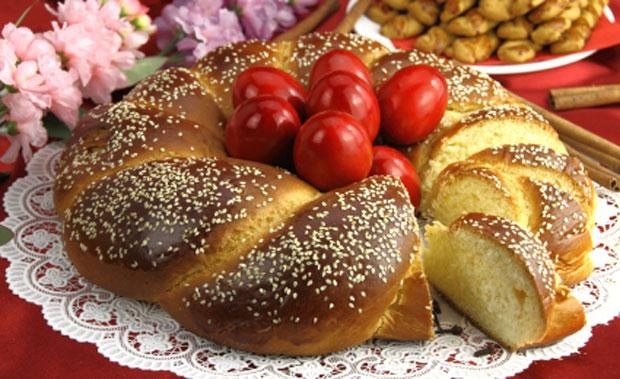 An easy recipe for “tsoureki” sweet bread with olive oil, so much tasty and full of flavor, so light and above all… healthy! The perfect accompaniment to a morning coffee or to an afternoon tea brake… Just try it!!! In another big bowl pour the olive oil, orange juice, add the sugar, aromatics (orange zest and vanilla extract) and the salt and mix. Finally add the leaven and the flour little by little kneading it in at the same time until you get a dough smoothy and shiny. Oil the dough slightly and place in a big bowl covered with a cloth set aside in a warm place and let the dough rise for 1 hour and 30 minutes, until doubled in bulk. Deflate the dough, divide into 4 balls and form in shapes (braid, snail etc.). Place tsoureki loaves on a non-stick baking sheet, covered with a towel, and let them rise again for 20 minutes, until almost doubled in bulk. In the meantime, preheat the oven to 160oC – 180oC (depending on the oven). If you want your loaves to have a nice sheen brush them with milk or an egg yolk mixed with some milk. Sprinkle with the almond slivers and bake for about 30 minutes or until nice and golden. With these quantities of ingredients you can make 4 medium size tsoureki loaves. You may add some special spices that used by Greeks :1 teaspoon of masticha powder and 2 teaspoons of mahlepi (mahleb), finely ground, which can be found at all good ethnic grocery stores. Eggplant is a vegetable that is a bit of a culinary chameleon. Mild in flavour, it can lend itself to many other ingredients. It can also vary in texture depending on how it’s prepared. Eggplant and it’s many varieties are used extensively in Mediterranean cooking and this week I’m providing a meatless version of Greek moussaka. This dish typically includes ground lamb, along with eggplant and tomatoes. The topping is a creamy béchamel sauce. This version features meaty, Portobello mushrooms in place of the ground lamb along with chickpeas to add some texture and substance. The topping is a mashed potato and cheese combination. The seasonings that make it a classic “Greek” dish include garlic, oregano and cinnamon. This easy dish can be prepared ahead and warmed up before serving. It would be ideal served with a salad of mixed greens dressed with fresh lemon juice and a bold extra virgin olive oil. Vegetarian moussaka would be a great addition to the upcoming Easter celebration. Slice eggplant into 1/2 inch (1.25 cm) rounds. Place in single layer on two baking sheets. Brush with half of the olive oil. While eggplant is roasting, cook potatoes in a large pot of salted water until tender. Reserve 1/2 c. (125 ml) of the cooking liquid. Drain potatoes. Return to pot. Add reserved water, 1/4 c. (50 ml) olive oil, milk and cheese. Mash. Season with salt and pepper to taste. Set aside. In a sauté pan, heat remaining olive oil over medium heat. Add the onion, carrot, celery, garlic and mushrooms. Cook, stirring frequently until carrot and celery are soft. Stir in the oregano, cinnamon, tomatoes and chickpeas. Season with salt and pepper to taste. In a 13 x 9 greased ovenproof dish, layer half of the eggplant on the bottom. Spoon half of the tomato/chickpea mixture on top followed by remainder of eggplant. Spoon remainder of tomato/chick pea mixture on top of that. Top with potato mixture. Drizzle a bit of olive oil. Bake in oven for 35-45 minutes or until potatoes are light golden. 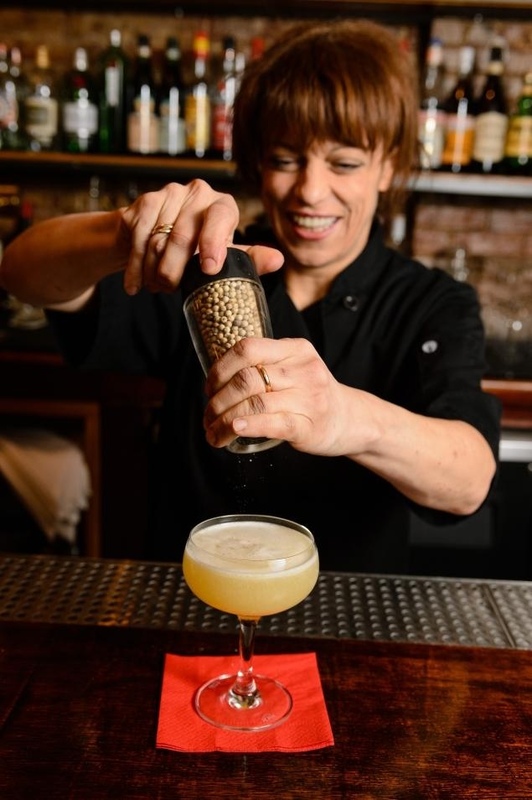 Restaurants in New York are adding the fruity and spicy taste of olive oil to mixed drinks. Check out cocktails like the Trickle Back and others at the Butterfly, Molyvos, Krescendo, Atrium and the Musket Room Nancy Puglisi puts the finishing touches on an EVOlution cocktail at Krescendo in Boerum Hill. Oil and water may not mix — but olive oil and alcohol do. Long used for sautéing, salad dressings and in beauty products, the fatty flavor booster is now part of cocktails at bars across the boroughs. Valentine’s Day is fast approaching and even if you don’t have a significant other, take the time to celebrate the most important person in your life – you! 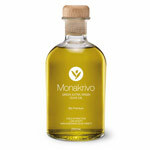 Below are two recipes to get you started on a delicious gourmet meal with Extra Virgin Olive Oil. Enjoy! Place the mixed greens in a pretty bowl and top with sliced avocado and strawberries. Drizzle dressing over everything, then sprinkle with pecans. Refrigerate for up to two hours before serving or serve immediately. Preheat oven to 200 degrees. Place a serving platter in the oven to warm. Season the chicken breasts with salt and pepper and dredge them in flour. Shake off excess flour. Heat the olive oil in a skillet and pan-fry the chicken breasts until golden brown on both sides, about four minutes per side. Place the chicken breasts on the warmed platter in the oven. When finished with the chicken, drain most of the oil from the skillet, leaving a thin coating on the surface of the pan. Cook and stir the minced garlic in the skillet until fragrant, about 20 seconds. Pour in the chicken broth. Scrape and dissolve any brown bits from the bottom of the skillet. Stir in the lemon slices and bring the mixture to a boil. Let cook, stirring occasionally, until the sauce reduces to about 2/3 cup, five to eight minutes. Add the lemon juice and capers; simmer until the sauce is reduced and slightly thickened, about five minutes more. Drop the butter into the skillet and swirl it into the sauce by tilting the skillet until the butter is melted and incorporated. Add the parsley; remove from heat and set aside. Arrange the chicken breasts on serving plates and spoon sauce over each portion to serve. 1. Using a food processor, process all lemon-oregano pesto ingredients until the mixture forms a smooth paste. Add more olive oil if you prefer a looser sauce. Pour into a small bowl for serving; garnish with a parsley leaf. 2. Preheat oven to 550 degrees. Spread salt over the bottom of a 10-inch gratin dish or other shallow ovenproof dish. The salt should be about 3/4-inch thick. Place prawns, on their sides, in a single layer in the salt, pushing them down slightly to partially bury them in the salt. Roast until prawns are pink, about 5 minutes. Serve straight from the baking dish, with a small bowl or ramekin of pesto nestled in the corner. Serve while hot. If the thought of a turkey re-run is enough to drive you round the bend, why not try these Norwegian recipes for a post-Christmas change? Allow three days to make this. Salt the cod very generously. Place in a pan and cover with water. Put it in the refrigerator for two days, changing the water three or four times. Drain and rinse the cod. In a pan, add the herbs, onion and garlic to the milk and heat for five minutes. Do not let it boil. Add the cod and poach until tender (five to seven minutes). Gently remove the cod with a slotted spoon. Remove any bones and skin, and break the flesh into coarse chunks. Meanwhile peel and dice the potatoes. Cook in well-seasoned water or, better still, use the milk the fish was poached in. When the potatoes are tender, drain (reserving a couple of tablespoons of the cooking liquid) and purée, in either a ricer or a mixer using the paddle attachment. Take out one third of the potatoes and mix in the cod (at a medium speed, if using a mixer), drizzling in the olive oil and a bit of the cooking liquid. Add the rest of the potatoes gradually and keep mixing and adding liquid until it is the consistency you like. To make the chive oil, mix together the olive oil and chopped chives, season with salt and pepper. Pound with a pestle and mortar. To serve, shape the cod into an egg shape using two spoons and place on thin crackers. Serve the chive oil on the side. Christmas, a time for family, rest and relaxation for all… wrong! Not if you are the one in charge of the most important task of the day, the main event that everyone comes to your house for – no, not trying to keep grandma away from the sherry but cooking the Christmas turkey. Step 9: Heat the orange in the microwave for 30 seconds to release the oils and push it into the turkey’s cavity. Then place the bird in a large roasting tin and surround it with the onions, carrots and the rest of the garlic. Beat together olive oil, sugar, orange juice and cognac. Sift flour, baking powder, cinnamon and baking soda. Add the sifted dry ingredients to the oil mixture and knead gently. Pinch off small portions of dough the size of an egg and form into little patties. Roll them to make oblong rolls. Place on the baking tray and bake in moderate oven for 30 minutes at 180C. Boil honey, sugar and water for 5 minutes. Allow to soak for 2-3 hours, take them out of the syrup and place on large plate. Sprinkle with chopped walnuts and cinnamon. You can preserve them in a storage box for a very long time… at least one month! Add one tablespoon of roasted sesame (rub in blender to become powder) in the mixture of walnuts and cinnamon. This will give a special flavor to your cookies. This is an impressive dish but it really does need to be cooked medium rare. It is simple to prepare and rather elegant when presented on a large serving platter. Ask your butcher to prepare a French-trimmed rack of lamb. This dish also works really well with the mint and coriander salsa. To prepare the lamb, trim the fillet to remove any sinew, outer layers of fat or white membrane. In a large pan, dry-fry the peppercorns and coriander seeds for the pepper crust. You just want to toast them gently to release their flavour. Be careful not to burn them or to allow the pan to smoke. Remove them from the heat and crush with a pestle and mortar. Then add the salt and thyme and mix well. Spread the mixture out on a flat tray. Pour the olive oil into a flat dish. Roll the lamb (loin end) in the olive oil and then roll it in the pepper crust mixture. Continue until the lamb is evenly covered in a thin layer of spice crust. Tightly wrap the crusted loin end in cling film and then in tin foil. Place in the fridge overnight or for a minimum of 2 hours. Make sure to remove the lamb from the fridge at least one hour before you are going to cook it, to allow it to come back up to room temperature. To prepare the jus, sauté the shallots, rosemary and garlic in 50g of the butter. Season with salt and pepper. Add the stock, balsamic vinegar and Madeira wine, bring up to the boil and then reduce to a simmer. Let the jus gently simmer until the liquid has reduced in volume by half. Remove from the heat. Check the seasoning and add more if needed. Preheat the oven to 200°C fan/220°C/gas mark 7. To cook the lamb, heat a non-stick frying pan with a little vegetable oil in it. When it is very hot, add the lamb (loin end) and sear it on all sides for 1ƒ-2 minutes on each side until evenly browned all over. Place in a roasting tin and scatter with the whole garlic cloves and sprigs of rosemary. Place the roasting tin in the oven for 18 minutes for medium rare. Remove from the oven. Cover with a damp tea towel and then tin foil and allow to rest in a warm oven (65-70°C) for at least 5 minutes before carving. After the lamb has been cooked, strain the meat juices from the pan into the jus. Then gently heat the gravy and whisk in the remaining 50g of cubed butter, until the butter is melted. Set aside for 5 minutes and then scoop off any fatty residue from the top of the jus. To serve, carve into cutlets, and serve with a selection of seasonal vegetables. Drizzle the jus over the lamb cutlets. I prefer the texture of the jus with the finely-chopped shallots. You can also thicken the jus with a roux if you like. For vegetarians, Christmas can be a bit of a nightmare. Surrounded by turkeys, pigs in blankets and vegetables cooked in all kinds of fats, it’s nigh-on impossible not to end up with some sort of animal protein in your face. But, as all veggies and vegans know, there’s more to Christmas than turkey. • Put the sweet potato in a large roasting tray along with a splash of olive oil. • Grind together the rosemary and thyme lightly for 1-2 minutes with a pestle and mortar. This helps to release the flavor. Then scatter over the sweet potato. • Make sure the tray with the sweet potato is covered with tin foil and place in the oven for approximately 45 minutes until soft. Once soft, remove from oven and leave to cool. • In the meantime, heat olive oil in a saucepan on medium heat. Once the oil is hot, add the sliced onions along with a pinch of salt and pepper for flavoring. • Gently cook the onions until lightly brown and soft. • Add the crumbled chestnuts to the lightly brown onion and cook for further 2 minutes. • Toast the sourdough bread until dark and golden. Tear the toasted bread into small chunks and drizzle with olive oil. Set aside. • Add the toasted bread to the pan with the onions and chestnuts. Once combined, add the lemon zest and remove the pan from the heat. • To prepare the mushrooms, begin by melting the butter in a pan over a medium heat. Add the mushrooms and garlic and cook until the mushrooms are soft and the liquid from the mushrooms has cooked off. • Squeeze in a little lemon juice to the mushrooms. Remove the pan from the heat, pour the contents into a blender and blend into a paste. • To prepare the kale, bring a large pan of salted water to the boil. Tear the kale into small pieces and add to the water for 2 minutes. Then add the spinach and cook for another 30 seconds. Drain and set aside. • Use a large bowl to mix the kale and spinach with the pine nuts, a splash of olive oil and a pinch of salt and pepper. • To assemble your Wellington, roll out the puff pastry on a sheet of baking parchment until approximately 40cm x 30xm. Once equally rolled, spread out the mushroom paste on top. • Mix together the spinach, sweet potato and onion-bread mixture. Use a spoon to place it in a thick line down the middle of the rolled pastry, on top of the mushroom paste, leaving a gap at either side so you can join up the edges of the Wellington. • Hold one side of the baking parchment and lift it, with the pastry, towards the center of the Wellington so the filling is half covered. • Peel the baking parchment back, leaving the pastry in place and then repeat this process with the other side. The pastry should overlap in the middle when complete. • Beat the egg with the milk and brush it over the folded pastry to seal the join. • Fold up the ends of the pastry so the filling doesn’t leak out, then carefully roll the Wellington onto a baking sheet, with the seal underneath. Brush all over with the remainder of the egg mix. • Put in the preheated oven and bake for 45 minutes until puffed up, golden brown and hot through the middle. Nobody is going to blame you if your holiday party spread includes a bowl of mixed nuts, some grapes and a wedge or two of cheese. After all, most people enjoy them and are willing to nibble mindlessly on them. But it is easier than you think to elevate your feast by bolstering those tired party snack clichés with a few more creative offerings. You won’t need to work very hard at this. Most holiday party snacks can be assembled in less than 10 minutes, and many can be assembled ahead of time. And the only truly important rule is to make sure everything is neat and easy to eat (one-handing it really is best for party food). To help get your party started, we’ve assembled some of our favorite snack ideas. We’ve even given you a way to jazz up your basic bowl of mixed nuts. ■ Marinated olives: Whisk together 2 tablespoons extra virgin olive oil, 3 tablespoons balsamic vinegar, zest of 1 orange, 2 minced cloves garlic and 2 tablespoons finely minced fresh rosemary. Toss with 2 cups mixed pitted olives. Refrigerate and allow to marinate for at least 4 hours. Bring to room temperature before serving. ■ Smashed lemon cannellini beans: Drain and rinse a 15-ounce can of cannellini beans. Pat dry with paper towels, then spread on a dinner plate. Roughly smash the beans with a fork or potato masher. Drizzle all over with extra virgin olive oiland lemon juice. Sprinkle with grated lemon zest, chopped fresh oregano, coarse sea salt, black pepper and smoked paprika. Serve with toasted pita chips. ■ Marinated mozzarella with anchovy and peanuts: Mash 3 anchovies with a fork in a medium bowl. Add 1/2 cup good extra virgin olive oil, 1 pound cubed, drained fresh mozzarella, a pinch of red pepper flakes, 2 cloves grated garlic, 1/4 cup torn fresh basil leaves, and 1/2 cup lightly chopped unsalted peanuts. Serve with bread for scooping.